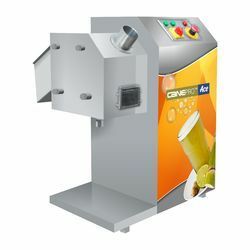 4 Roller Heavy Duty Sugarcane Juice Machine with Instant Chiller with its state-of-the-art technology and high-speed operations suits all the demands of your business establishment. CanePro 4 Roller is the most efficient sugarcane juicer helping you to maximize your profits by yielding more juice per kilogram of sugarcane than any other juicer in the market. The juicer features a 1.5 Hp motor, a gearbox from Motovario, Italy, and Thread knurling rollers which extracts 100% of the juice in a single pass. It can crush up to 4 kgs per minute and so can easily serve up to 10 cups a minute measuring 250 ML. Be it a luxurious juice bar or a high volume retail outlet, CanePro ACE with its state-of-theart technology and high speed operations suits all the demands of your business establishment. CanePro ACE is the most efficient sugarcane juicer helping you to maximize your profits by yielding more juice per kilogram of sugarcane than any other juicer in the market. The juicer features a 1.5 Hp motor, a gearbox from Motovario, Italy, and diamond knurling rollers which extracts 99% of the juice in a single pass. It can crush up to 3 kgs per minute and so can easily serve up to 8 cups a minute measuring 250 ML. Sugarcane Juicer CanePro 1HP is a powerful and reliable sugarcane juicer that delivers maximum efficiency even under long periods of usage. The machine features a 1 Hp Motor, gearbox from Motovario, Italy and diamond knurling rollers which help to extract 95% of the juice in a single pass. Power Trip: In a case of over load to the motor, the machine automatically trips to cut the power supply to the motor. Emergency Stop: This feature gives the operator quick access to stop the operations of the machine with one simple press of a button. Looking for Sugarcane Juice Extractor ?